"Drag racer" and "Drag race" redirect here. For other uses, see Drag racing (disambiguation). Drag racing is a type of motor racing in which automobiles or motorcycles (usually specially prepared for the purpose) compete, usually two at a time, to be first to cross a set finish line. The race follows a short, straight course from a standing start over a measured distance, most commonly 1⁄4 mi (1,320 ft; 402 m), with a shorter (1,000 ft (305 m)) becoming increasingly popular, as it has become the standard for Top Fuel dragsters and funny cars, where some major bracket races and other sanctioning bodies have adopted it as the standard, while the 1⁄8 mi (660 ft; 201 m) is also popular in some circles. Electronic timing and speed sensing systems have been used to record race results since the 1960s. The history of automobiles and motorcycles being used for drag racing is nearly as long as the history of motorized vehicles themselves, and has taken the form of both illegal street racing, and as an organized and regulated motorsport. This article covers the legal sport. Push starts to get engines running were necessary until the National Hot Rod Association (NHRA) mandated self-starters in 1976. After burnouts, cars would be pushed back by crews; this persisted until NHRA required reversing systems in 1980. Don Garlits was the first to do burnouts across the starting line, which is now standard practise. Each driver then backs up to and stages at the starting line. Before each race (commonly known as a pass), each driver is allowed to perform a burnout, which heats the driving tires and lays rubber down at the beginning of the track, improving traction. The cars run through a "water box" (formerly a "bleach box", before bleach was replaced by flammable traction compound, which produced spectacular, and dangerous, flame burnouts; the hazard led NHRA to mandate use of water in the 1970s). Modern races are started electronically by a system known as a Christmas tree, which consists of a column of lights for each driver/lane, and two light beam sensors per lane on the track at the starting line. Current NHRA trees, for example, feature one blue light (split into halves), then three amber, one green, and one red. When the first light beam is broken by a vehicle's front tire(s), the vehicle is "pre-staged" (approximately 7 inches (180 mm) from the starting line), and the pre-stage indicator on the tree is lit. When the second light beam is broken, the vehicle is "staged", and the stage indicator on the tree is lit. Vehicles may then leave the pre-stage beam, but must remain in the stage beam until the race starts. Once one competitor is staged, their opponent has a set amount of time to stage or they will be instantly disqualified, indicated by a red light on the tree. Otherwise, once both drivers are staged, the system chooses a short delay at random (to prevent a driver being able to anticipate the start), then starts the race. The light sequence at this point varies slightly. For example, in NHRA Professional classes, three amber lights on the tree flash simultaneously, followed 0.4 seconds later by a green light (this is also known as a "pro tree"). In NHRA Sportsman classes, the amber lights illuminate in sequence from top to bottom, 0.5 seconds apart, followed 0.5 seconds later by the green light (this is also known as a "sportsman tree" or "full tree"). If a vehicle leaves the starting line before the green light illuminates, the red light for that lane illuminates instead, and the driver is disqualified (also known as red lighting). In a handicap start, the green light automatically lights up for the first driver, and the red light is only lit in the proper lane after both cars have launched if one driver leaves early, or if both drivers left early, the driver whose reaction time is worse (if one lane has a -.015 and the other lane has a -.022, the lane of the driver who committed a 0.022 is given the red light after both cars have left), as a red light infraction is only assessed to the driver with the worse infraction, if both drivers leave early. Even if both drivers leave early, the green light is automatically lit for the driver that left last, and they still may win the pass (as in the 2014 NHRA Auto Club Pro Stock final, Erica Enders-Stevens and Jason Line both committed red light infractions; only Line was assessed with a red light, as he was -.011 versus Enders-Stevens' -.002). Several measurements are taken for each race: reaction time, elapsed time, and speed. Reaction time is the period from the green light illuminating to the vehicle leaving the starting line. Elapsed time is the period from the vehicle leaving the starting line to crossing the finish line. Speed is measured through a speed trap covering the final 66 feet (20 m) to the finish line, indicating average speed of the vehicle in that distance. Except where a breakout rule is in place, the winner is the first vehicle to cross the finish line, and therefore the driver with the lowest combined reaction time and elapsed time. Because these times are measured separately, a driver with a slower elapsed time can actually win if that driver's advantage in reaction time exceeds the elapsed time difference. In heads-up racing, this is known as a holeshot win. In categories where a breakout rule is in effect (for example, NHRA Junior Dragster, Super Comp, Super Gas, Super Stock, and Stock classes, as well as some dial-in classes), if a competitor is faster than his or her predetermined time (a "breakout"), that competitor loses. If both competitors are faster than their predetermined times, the competitor who breaks out by less time wins. Regardless, a red light foul is worse than a breakout, except in Junior Dragster where exceeding the absolute limit is a cause for disqualification. Most race events use a traditional bracket system, where the losing car and driver are eliminated from the event while the winner advances to the next round, until a champion is crowned. Events can range from 16 to over 100 car brackets. Drivers are typically seeded by elapsed times in qualifying. In bracket racing without a breakout (such as NHRA Competition Eliminator), pairings are based on times compared to their index (faster than index for class is better). In bracket racing with a breakout (Stock, Super Stock, but also the NHRA's Super classes), the closest to the index is favourable. A popular alternative to the standard eliminations format is the Chicago Style format (also called the Three Round format in Australia), named for the US 30 Dragstrip in suburban Gary, Indiana where a midweek meet featured this format. All entered cars participate in one qualifying round, and then are paired for the elimination round. The two fastest times among winners from this round participate in the championship round. Depending on the organisation, the next two fastest times may play for third, then fifth, and so forth, in consolation rounds. Currently, an IHRA 400 Thunder championship race in Australia uses the format. The standard distance of a drag race is 1,320 feet, 402 m, or 1/4 mile. However, due to safety concerns, certain sanctioning bodies (notably the NHRA for its Top Fuel and Funny Car classes) have shortened races to 1,000 feet. Some drag strips are even shorter and run 660 feet, 201 m, or 1/8 mile. The 1,000 foot distance is now also popular with bracket racing, especially in meets where there are 1/8 mile cars and 1/4 mile cars racing together, and is used by the revived American Drag Racing League for its primary classes (not Jr Dragster). Some organisations that deal with Pro Modified and "Mountain Motor" Pro Stock cars (Professional Drag Racers Association) use the 1/8 mile distance, even if the tracks are 1/4 mile tracks. Chief Timer delivering timeslips to competitors after their passes. Blown altered doing a burnout at Interlake Dragways, Gimli, Manitoba. The National Hot Rod Association (NHRA) oversees the majority of drag racing events in North America. The next largest organization is the International Hot Rod Association (IHRA). Nearly all drag strips are associated with one sanctioning body or the other. Besides NHRA and IHRA, there are niche organizations for muscle cars and nostalgia vehicles. The Nostalgia Drag Racing League (NDRL) based in Brownsburg, IN, runs a series of 1/4 mile (402m) drag races in the Midwest for 1979 and older nostalgic appearing cars, with four classes of competition running in an index system. Pro 7.0 and Pro 7.50 run heads up 200 mile per hour (320 kilometre per hour) passes, while Pro Comp and Pro Gas run 8.0 to 10.0 indices. NDRL competition vehicles typically include Front Engine Dragsters, Altereds, Funny Cars, early Pro Stock clones, Super Stocks and Gassers. The National Electric Drag Racing Association (NEDRA) races electric vehicles against high performance gasoline-powered vehicles such as Dodge Vipers or classic muscle cars in 1/4 and 1/8 mile (402m & 201m) races. The current electric drag racing record is  6.940 seconds at 201.37 mph (324.0736 kph) for a quarter mile (402m). Another niche organization is the VWDRC which run a VW-only championship with vehicles running under 7 seconds. Prior to the founding of the NHRA and IHRA, smaller organizations sanctioned drag racing in the early years, which included the competing AHRA in the United States from 1955 to 2005. The first Australian Nationals event was run in 1965 at Riverside raceway, near Melbourne. The Australian National Drag Racing Association (ANDRA) was established in 1973, and today they claim they are the "best in the world outside the United States". ANDRA sanctions races throughout Australia and throughout the year at all levels, from Junior Dragster to Top Fuel. The ANDRA Pro Series is for professional drivers and riders and includes Top Fuel, Top Alcohol, Top Doorslammer (similar to the USA Pro Modified class), Pro Stock (using 400 cubic inch engines (6.5 litres)), Top Bike and Pro Stock Motorcycle. The Rocket Allstars Racing Series is for ANDRA sportsman drivers and riders and includes Competition, Super Stock, Super Compact, Competition Bike, Supercharged Outlaws, Modified, Super Sedan, Modified Bike, Super Street and Junior Dragster. Broadcasting is provided on SBS Speedweek. In 2015, after a dispute with ANDRA, Sydney Dragway, Willowbank Raceway and the Perth Motorplex invited the International Hot Rod Association (IHRA) to sanction events at their tracks. Since then the Perth Motorplex has reverted to an ANDRA sanction and Springmount Raceway has embraced the IHRA umbrella. The 400 Thunder Series now attracts professional racers to its races at Sydney Dragway and Willowbank Raceway and is the premiere series in Australia. Communications Provider OVO Mobile provides a live stream of all 400 Thunder Australian Professional Drag Racing Series events to fans globally. The 400 Thunder Series is aired on Fox Sports with each professional bracket having its own half hour program from each 400 Thunder Series event. Drag racing was imported to Europe by American NATO troops during the Cold War. Races were held in West Germany beginning in the 1960s at the airbases at Ramstein and Sembach and in the UK at various airstrips and racing circuits before the opening of Europe's first permanent drag strip at Santa Pod Raceway in 1966. The FIA organises a Europe-wide four wheeled championship for the Top Fuel, Top Methanol Dragster, Top Methanol Funny Car, Pro Modified and Pro Stock classes. FIM Europe organises a similar championship for bike classes. In addition, championships are run for sportsman classes in many countries throughout Europe by the various national motorsport governing bodies. Drag racing in New Zealand started in the 1960s. The New Zealand Hot Rod Association (NZHRA) sanctioned what is believed to have been the first drag meeting at an open cut coal mine at Kopuku, south of Auckland, sometime in 1966. In 1973, the first and only purpose built drag strip opened in Meremere by the Pukekohe Hot Rod Club. In April 1993 the governance of drag racing was separated from the NZHRA and the New Zealand Drag Racing Association (NZDRA) was formed. In 2014, New Zealand's second purpose built drag strip - Masterton Motorplex - opened. The first New Zealand Drag Racing Nationals was held in the 1966/67 season at Kopuku, near Auckland. There are now two governing bodies operating drag racing in New Zealand with the Florida-based International Hot Rod Association sanctioning both of New Zealands major tracks at Ruapuna (Pegasus Bay Drag Racing Association) in the South Island and Meremere Dragway Inc in the North Island. However, the official ASN of the sport, per FIA regulations, is the New Zealand Drag Racing Association. Many countries in South America race 200 meters, unlike in the United States and Australia, where 400 meters or 1/4 mile is typical. Organized drag racing in Colombia is the responsibility of Club G3, a private organization. The events take place at Autódromo de Tocancipá. All racing events, including street legal competitions, happen at the Curaçao International Raceway. On the island of Aruba all racing events, including street legal competitions, happen at Palomarga international raceway. On the island of Barbados, organization of drag racing events is done by the Barbados Association of Dragsters and Drifters. Currently the drag racing is done at Bushy Park racing circuit over 1/8 mile, while "acceleration tests" of 1/4 mile are done at the Paragon military base. On the Island of Saint Lucia, organization of drag racing events is done by Time Line Events, currently races are held at the US Old military base also known as the "Ca Ca Beff", "The Base" near the Hewanorra International Airport in Vieux Fort. On Santo Domingo, organization of drag racing events is done by Autodromo Sunix and they happen at the Autodromo Sunix, close to the Airport SDQ. Organized drag racing is rapidly growing in India. Autocar India organised the country's first drag race meet in Mumbai in 2002. Drag racing is also gaining popularity in Pakistan, with private organizations organizing such events. The Bahria Town housing project recently organized a drag racing event in Rawalpindi, with the help of some of the country's best drivers. Sri Lanka has seen an immense growth in Drag racing through legal meets held by the Ceylon Motor Sports Club, an FIA sanctioned body. In recent years, exotic cars and Japanese power houses have been taking part in these popular events. Drag racing is an established sport in South Africa, with a number of strips around the country including Tarlton International Raceway and ODI Raceway. Drag racing is controlled by Motorsport South Africa and all drivers are required to hold a valid Motorsport South Africa license. Drivers can compete in a number of categories including Top Eliminator, Senior Eliminator, Super Competition Eliminator, Competition Eliminator, Pro Street Bikes, Superbike Eliminator, Supersport Shootout (motorcycle), Street Modified, and Factory Stock. Caterpillar-sponsored dragster. Note wide slicks and high-mounted wing, to assist traction. There are hundreds of classes in drag racing, each with different requirements and restrictions on things such as weight, engine size, body style, modifications, and many others. NHRA and IHRA share some of these classes, but many are solely used by one sanctioning body or the other. The NHRA boasts over 200 classes, while the IHRA has fewer. Some IHRA classes have multiple sub-classes in them to differentiate by engine components and other features. There is even a class for aspiring youngsters, Junior Dragster, which typically uses an eighth-mile track, also favored by VW racers. In 1997, the FIA (cars) and UEM (bikes) began sanctioning drag racing in Europe with a fully established European Drag Racing Championship, in cooperation (and rules compliance) with NHRA. The major European drag strips include Santa Pod Raceway in Podington, England; Alastaro Circuit, Finland; Mantorp Park, Sweden; Gardermoen Raceway, Norway and the Hockenheimring in Germany. Pain Killer J/D. Note the driver, helmet off, is still in the car, which is under tow on the return road, headed for the pits. Top Fuel Dragster (TF/D). The dragsters, or "diggers", are the fastest class. Among the fastest-accelerating machines in the world, these cars can cover the dragstrip in less than 3.7 seconds and record trap speeds over 330 mph (530 km/h). Modern Top Fuel dragsters are 25 ft (7.6 m) long and weigh 2,320 lb (1,050 kg) in race-ready trim. Methanol mixed with up to 90% nitromethane is used as fuel. Top Fuel Funny Car (TF/FC) Similar to their dragster counterparts but with a shorter wheelbase and a carbon-fiber body that loosely resembles a production-based automobile, Funny Cars, or “floppers,” routinely run in the 4.0s and can exceed 315 mph. In 2017 NHRA driver Robert Height ran a career best ET. 3.793 and speed of 339.87 mph. A typical Pro Stock car. Pro Stock (NHRA, IHRA/MMPSA) Often called “factory hot rods” because of their resemblance to production-based cars (and because they must maintain a relatively stock appearance), and commonly known as "doorslammers", Pro Stockers can record quarter-mile times in the 6.4 second range, and speeds over 210 mph (340 km/h). They can rev to more than 10,500 rpm and make in excess of 1,300 hp (970 kW). NHRA engines can be no more than 500-cubic-inch (8.2 L) displacement while MMPSA cars can run a maximum of 820 cubic inches (13.4 L) (called "Mountain Motors"). IHRA engines can be no more than 400-cubic-inch (6.6 L). Both classes require the motors to be naturally aspirated. Pro Stock Motorcycle (NHRA and IHRA) These highly modified vehicles, which can run under 6.8 seconds at more than 195 mph, feature a purpose-built tube chassis and a lightweight, aerodynamically enhanced replica of original bodywork. Pro Modified (Pro Mod). Known as Top Doorslammer in Australia. Some engine restrictions, very high power. Cars can run superchargers, turbochargers, or nitrous oxide. Cars running blowers are limited to 527 cubic inches (8.6 L) while cars with nitrous can run up to 740 cubic inches (12.1 L). This class is globally recognised, although the name differs between North America and Australia. Top Alcohol Dragster (TA/D). Known as Top Methanol Dragster in FIA competition. Top Alcohol Dragsters resemble Top Fuelers, but have significant differences. They may use a supercharged methanol-burning engine or an injected nitromethane combination. They can run in the 5.1s at more than 280 mph. Top Alcohol Funny Car (TA/FC). Known as Top Methanol Funny Car in FIA competition. Similar in physical appearance to their nitro-burning Funny Car counterparts, Top Alcohol Funny Cars are restricted to the use of methanol fuel and have three-speed transmissions. They can run in the 5.4s at more than 265 mph. In the IHRA, Alcohol Funny Car is the fifth pro category, replacing NHRA's Pro Stock Bike. Competition Eliminator This is the NHRA class with the most variety. Each of its 88 sections is assigned an index based on what a well-built car should run, and races are handicapped according to those indexes. Sport Front-Wheel-Drive (SFWD) This is a class that is dedicated to solely front wheel drive vehicles. One of the motivations behind the creation of this class was to keep cars as original looking as they could possibly be. SFWD is one of the most common and popular import drag racing classes. The two most common vehicles in this class are the Honda Civic and the Acura Integra. In this class, the number one restriction is that each vehicle must retain its original chassis. No modification to the OEM floorboard or Firewall is permitted. In addition, at least one headlight and both brake lights must be fully functional. Suspension and brake modifications are allowed to a certain extent. Aftermarket components are permitted as long as the original mounting points are not modified. All four brakes must be retained and parachutes are permitted. The stock dashboard and windshield must be retained along with the car's original interior from the front seats forward, while rear seats as well as passenger-side seat may be removed. Racing gas or E85 may be used; methanol may not. Internal engine modifications of all types, aftermarket engine blocks, and engine swaps are permitted. Engines may use nitrous oxide or be turbocharged. Tires may be a maximum of 25 in (640 mm) tall and 9.5 in (240 mm) in tread width. All cars must meet a minimum weight requirement of 2,200 lb (1,000 kg), plus any weight penalties teams may incur for having certain equipment installed that would have given them too much of an advantage over the competition. Super Comp/Quick Rod The quickest of the heads-up Super classes (8.90 index) is composed primarily of dragsters. Most cars are capable of running well under the index but use electronic aids to run close to it without breaking out. Super Gas/Super Rod Super Gas entries, which run on a 9.90 index, are primarily full-bodied cars and street roadsters. No dragsters or altereds are permitted. As in Super Comp, competitors use electronic aids to run as close to the class standard without going under. Super Street/Hot Rod Racers compete on a fixed 10.90 index. All vehicles must be full-bodied cars and weigh no less than 2,800 pounds except for six-cylinder cars (2,000) and four-cylinder and rotary-powered cars (1,200). Engine and chassis modifications are virtually unlimited. Super Stock Super Stock vehicles resemble ordinary passenger cars, but are actually heavily modified. Entries are classified using factory shipping weight and horsepower and compete on indexes. The breakout rule is enforced. Stock Stock cars are similar to Super Stockers, but rules regarding everything from engine modifications to body alterations are much stricter. Virtually any car is eligible to compete, and entries are classified using factory shipping weight and horsepower. Top Sportsman (NHRA, IHRA, ANDRA) Competitors in these full-bodied entries may choose their own dial-in for eliminations, generally from 6.00 to 7.99 seconds. Full Tree starts are used, and the breakout rule is enforced. Cars can run in the sixes at more than 200 mph (320 km/h). Top Dragster (T/D) (NHRA, IHRA, ANDRA) Competitors in these open-wheel entries may choose their own dial-in for eliminations, generally from 6.00 to 7.70 seconds. Full tree starts are used, and the breakout rule is enforced. Cars can run in the sixes at more than 200 mph (320 km/h). Cars can run any combination of motor: blown, turbo, nitrous or just all motor. NHRA and ANDRA Summit Racing series Super Pro, Pro, and bike. Junior Dragster (racers between the ages of 8 and 18 may race a half scale version of the sport's fastest car, Top Fuel Dragster. Juniors run as follows: 12.90-slower for 8-9 year olds, 10-12 year olds at 8.90, and 13-18 year olds 7.90 and slower at a top speed of 85 mph). These cars race at 1/8 mile or 1/16 mile. NHRA new class for Juniors is JR COMP running 6.90s at a top speed of 110 miles per hour (180 km/h) (1/8 mile or 1/16 mile). A complete listing of all classes can be found on the respective NHRA and IHRA official websites. The UEM also has a different structure of professional categories with Top Fuel Bike, Super Twin Top Fuel Bike, and Pro Stock Bike contested, leaving the entire European series with a total of 8 professional categories. To allow different cars to compete against each other, some competitions are raced on a handicap basis, with faster cars delayed on the starting line enough to theoretically even things up with the slower car. This may be based on rule differences between the cars in stock, super stock, and modified classes, or on a competitor's chosen "dial-in" in bracket racing. For a list of drag racing world records in each class, see Dragstrip#Quarter mile times. A 'dial-in' is a time the driver estimates it will take his or her car to cross the finish line, and is generally displayed on one or more windows so the starter can adjust the starting lights on the tree accordingly. The slower car will then get a head start equal to the difference in the two dial-ins, so if both cars perform perfectly, they would cross the finish line dead even. If either car goes faster than its dial-in (called breaking out), it is disqualified regardless of who has the lower elapsed time; if both cars break out, the one who breaks out by the smallest amount wins. However, if a driver had jump-started (red light) or crossed a boundary line, both violations override any break out (except in some classes with an absolute break out rule such as Junior classes). The effect of the bracket racing rules is to place a premium on consistency of performance of the driver and car rather than on raw speed, in that victory goes to the driver able to precisely predict elapsed time, whether it is fast or slow. This in turn makes victory much less dependent on budget, and more dependent on skill, making it popular with casual weekend racers. The National Hot Rod Association (NHRA) was founded in 1951, to take illegal racing off the street. The organization banned the use of nitromethane in 1957, calling it unsafe, in part through the efforts of C. J. Hart; the ban would be lifted in 1963. 1954 — first slingshot, built by Mickey Thompson; Smokin' White Owl built by "Ollie" Morris, first purpose-built rear-engined dragster and first to use a Chevrolet V8 engine. 1962 — the Greer–Black–Prudhomme digger, with the best win record in NHRA history. 1974 — first tube chassis Pro Stock car, Bill Jenkins' '72 Vega. Bottle – nitrous system; also known as the jug. Blanket – a ballistic cover, typically over the supercharged intake manifold assembly to contain shrapnel, in the case of an explosion. Blown – supercharged, when describing a functioning engine; wrecked, when describing an engine failure. Breakout – in bracket racing, running quicker than dial-in; also "breaking out". Bulb(ed) – synonym for "redlight"
DA – density altitude; a reference to qualities in the air. ET – Elapsed time. Time from a car leaving the starting line to crossing the finish line. First or worst – if both drivers commit a foul, the driver who commits the foul first loses, unless it is two separate fouls, where the loser is the driver who committed the worse foul (lane violation is worse than foul start, and failure to participate in a post-run inspection is worst). any flip-top car Coined by dragster crews in the late 1960s to separate Funny Cars, which had fiberglass bodies with fenders, from dragsters. Grenade – an engine destroyed (the engine "grenaded") due to internal failure. Distinct from "popping a blower". Heads-up racing – a non-handicapped racing style where both drivers are started at the same time. Used in all professional ("pro") classes. Holeshot – gaining an advantage by a faster reaction time at the start. The other driver gets "holeshotted" or "left at the tree". Holeshot win – a race won by a driver with a slower elapsed time but a faster reaction time. Hook[ed] up – good traction between tires and track resulting in increased acceleration and reduced slipping or smoking of tires. James Bond – when a driver's reaction time is seven thousandths of a second after the green light (.007). A "James Bond Red" is a reaction time of -.007 seconds (red light), which is disqualification unless the opponent commits a more serious violation. Oildown – when a car's engine or lubrication breaks during a run, leaving a streak of oil and other fluids on the track. This is punishable by fines, point penalties, and/or suspension. Pro tree – style of starting a race where the timing lights flash all three yellow lights simultaneously, and after four tenths of a second, turn green. Compare to "Standard tree". Rail – dragster (as distinct from bodied car or flopper). From the exposed frame rails of early cars. Redlight(ed) – jump(ed) the start, left before tree turned green. This is a loss unless the opponent commits a more serious foul. Red Cherry – jumped the start, left before the tree turned green. Sandbagging – releasing the throttle or using the brakes at the end of the track during a bracket race after dialing a purposely slow time. Considered a dirty trick or tantamount to cheating in amateur classes. Slingshot – early front-engined dragster, named for the driving position behind the rear wheels (erroneously attributed to launch speed). Standard tree – style of starting a race where the timing lights flash in sequence five tenths of a second between each yellow light before turning green. Original starting method before introduction of pro tree. Top end – finish line of strip; high part of engine's rev band. Traction bars – rear struts fixed to rear axle to keep rear axle from twisting, causing wheel hop and loss of traction; slapper bars. Trap(s) – the 20-metre (66 ft) speed trap near the finish line to measure speed & E.T. Trap speed – the speed measured by the 60 foot speed trap near the finish line, indicating maximum speed reached in a run. Wheel hop – violent shaking of the car as the tires lose and regain traction in quick succession. Wheelie bars – rear struts fixed to rear axle, which protrude out to rear of car to help prevent car's front from raising too high or flipping over on launch. ^ "NHRA Glossary". NHRA. Archived from the original on September 3, 2013. Retrieved August 11, 2011. ^ "Encore Feature: Chicago Once a Funny Car Heaven". Competition Plus. Archived from the original on May 6, 2014. Retrieved March 21, 2014. ^ "Revolutionary new event format promises Easter thrills at Willowbank Raceway". Australian National Drag Racing Association. Retrieved March 21, 2014. ^ Mullin. "NDRL - Nostalgia Drag Racing League". Retrieved 2015-01-03. ^ "Drag racing history in Germany". dragracinghistory.de. ^ "UK drag racing history 1960-1964". www.trakbytes.co.uk. ^ "Drag racing on Curacao". curacaodrag.com. ^ "The Barbados Association of Dragsters & Drifters - BADD". The Barbados Association of Dragsters & Drifters - BADD. Retrieved 2016-07-25. ^ "Bushy Park Barbados". www.bushyparkbarbados.com. Retrieved 2016-07-26. ^ The Telegraph, Calcutta, "Men in Drag"
^ "CMSC – SLAF Drag Race on 24 August". Archived from the original on 26 April 2016. Retrieved 17 April 2016. ^ a b "2010 MSA Drag Racing Handbook" (PDF). Archived from the original (PDF) on 3 December 2010. Retrieved 31 October 2010. ^ "Sport Front-Wheel-Drive Class Explained - Honda Tuning Magazine". SuperStreetOnline. 2013-06-23. Retrieved 2017-11-29. ^ a b c Hot Rod, 12/86, p. 29 sidebar. ^ "Smokin' White Owl". Hot Rod. November 1954. ^ Post, Robert C. (2001). High Performance The Culture and Technology of Drag Racing 1950-2000. Baltimore, Maryland: Johns Hopkins University Press. p. 38. ISBN 0-8018-6664-2. ^ Street Rodder, 7/94, p.144. ^ Super Chevy, 5/94, p.16. ^ Graaf, Nathalie. "Reglementen Dragrace 2016" (PDF). The Basics of Drag Racing. KNAC Nationale Autosport Federatie. Retrieved 13 January 2017. ^ Breitenstein, Jeff. Ultimate Hot Rod Dictionary: A-Bombs to Zoomies. MotorBooks International. ISBN 9781610592352. 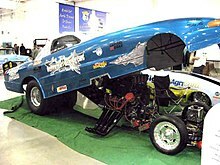 ^ "Drag Race Central - Presented by Summitracing.com 1-800-230-3030". Retrieved 17 April 2016. ^ ":::Drag Racing Online::: ANDRA Nationals at Sydney, Australia - 11/12/2012". Archived from the original on 25 March 2014. Retrieved 17 April 2016. ^ Its invention is credited to Vic King and Pete Wolley for their X/Gas digger in 1959. Dain Gingerelli, "Midnight Oil!" in American Rodder, 6/94, p.81. Robert C. Post. High Performance: The Culture and Technology of Drag Racing, 1950 - 2000. Johns Hopkins University Press, revised edition 2001. Look up dragster in Wiktionary, the free dictionary.